Officials accepted a letter from United acting secretary Glenn Souter outlining their intentions to pull the club’s first team - who currently play in SCFL Division 2 - out of the league. Lancing United chairman Ron George stepped down down from his position last Friday and it left the club unable to run both current first and reserve sides. SCFL chairman Steve Nealgrove was saddened to receive the letter of withdrawal from United officials at a monthly league meeting on Monday and said: “The SCFL had a letter of withdrawal from acting Lancing United secretary Glenn (Souter) at Monday’s meeting. We accepted the withdrawal and now await a response from the club to the charge. “We understand there are some internal fractions within the club and understand there is no other option for them. Souter, who is likely to take over as club chairman, felt there was no option but to withdraw the current first team from the SCFL. 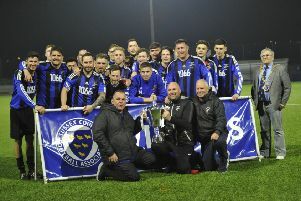 Lancing United were promoted from the West Sussex League less than two seasons ago but he believes a number of reasons have resulted in them now having to pull out of the SCFL. He said: “There are a few reasons as to why we’ve come to this decision as a club. Ron’s sudden decision to step away from the club means running both the first and reserve team is difficult. Ron dealt with the administration and matchday stuff for the first-team and without any willing volunteers continuing to run both teams would be difficult. “Another issue we’ve faced is player commitment this season. Getting a team out has proved tricky at times and we don’t want to continue and run the risk of having to forfeit matches. Lancing United must now respond to the charge from the SCFL. A hefty fine is likely to be handed to the club and all results from the season so far may be expunged.